Not only are games the most popular category of apps on smart phones, mobile users are also willing to pay for them, Nielsen reports. Games lead the popularity chart on apps used per month at 64 per cent followed by weather apps, social networking, maps/navigation and search, music, news, entertainment etc. Travel and health apps form 18 per cent and 123 per cent of the total apps downloaded in a month. 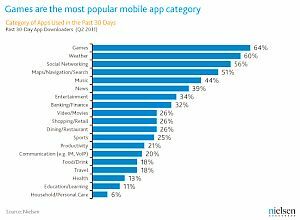 Around 32 per cent of apps used in a month were in the banking and finance category. According to a survey conducted by the research firm, 93 percent of people who actively download apps (have downloaded an app within the past 30 days) are willing to pay for the games they play. In contrast, 76 percent of users are willing to pay for news apps and 84 percent for maps/ navigation or search related apps on their mobiles. Across all digital domains, Gartner, Inc said the spend on gaming this year is expected to exceed $74 billion from $67 billion last year. According to the research firm, the amount of money that will be spent worldwide on gaming will reach $112 billion by 2015.
iPhone users play more than Android users, according to the Nielsen study. The average mobile gamer plays an average of 7.8 hours in a month. Those with iPhones tend to play around 14.7 hours each month while those with Android smartphones play around 9.3 hours per month. More handset makers are launching handsets targeted at gamers. The third largest handset manufacturer in the company in terms of sales Micromax, partnered with Nazara Technologies to pre-load games from Electronics Arts (EA) in its mobiles and Sony Ericsson launched Xperia Play, a bulky but attractive handset which seeks to draw gamers with titles such as Assassin's Creed â€“ Altair's Chronicles HD, Need for Speed and Tom Clancy's Splinter Cell.